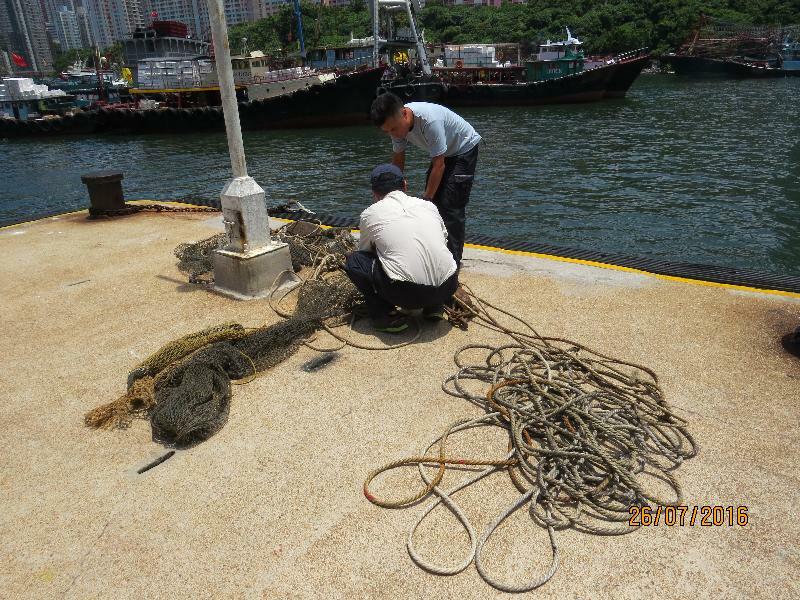 Agriculture, Fisheries and Conservation Department (AFCD) officers intercepted a trawler suspected to be operating illegally in the waters off Yuen Kok of Lamma Island today (July 26). During an anti-illegal fishing operation mounted in the southern waters of Hong Kong this morning, AFCD officers spotted a shrimp trawler suspected to be trawling in the area. The trawler was then intercepted for investigation and fishing gear including fishing nets and ropes were seized on board. The person-in-charge of the trawler is assisting investigation. An AFCD spokesman reminded the public that the ban on trawling has come into force on December 31, 2012. Any person who contravenes the ban and is convicted is liable to a maximum penalty of a fine of $200,000 and imprisonment for six months under the Fisheries Protection Ordinance (Cap 171). The spokesman noted that trawling is a non-selective fishing operation which damages the seabed and the marine ecosystems. A ban on trawling activities brings the harmful depletion to an immediate halt, enabling the marine ecosystems to be gradually rehabilitated to a sustainable level and be better conserved in the long run. The spokesman stressed, "The Government is committed to cracking down on illegal fishing activities. The AFCD will continue to step up patrols and stringently enforce the law, and at the same time maintain close liaison with relevant law enforcement departments and carry out joint enforcement operations as necessary."